Social Insects, Volume III emphasizes the insect symbionts that represent a very complex group of organisms with very diverse habits. This volume primarily focuses on various types of bees and their sociality. 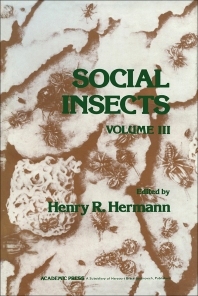 This book consists of four major chapters where the first chapter represents the conclusion of discussion on social insect phenomena. The three remaining chapters discuss in detail the biology of the featured eusocial insects. Chapter 1 includes a discussion on insects and other arthropods. The following chapters focus on various types of bee, including bumble bees, honey bees, and stingless bees. Chapter 2 focuses on the behavior and ecology of bumble bees, whereas Chapters 3 and 4 discuss in detail the different biological aspects of honey and stingless bees, respectively. Topics include the evolution of sociality, colony, caste differentiation, and distribution of these species. Students and researchers interested in the study of bees will find this book very valuable.